Rugadh Pádraig thart ar 385 AD. áit éigin in iarthar na Breataine. Calpurnius ab ainm dá athair agus Críostaí a bhí ann. Mhair Pádraig go breá sona go dtí lá amháin nuair a bhí sé thart ar sé bhliain déag d'aois. Thart ar 401 AD tháinig fear agus a shaighdiuirí trasna na farraige ó Éirinn. Niall Naoi-Ghiallach a bhí ann. 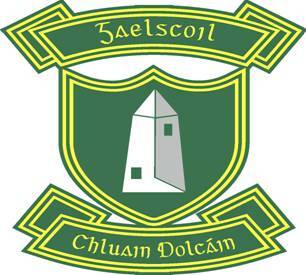 Ghoid said earraí na ndaoine agus na buachaillí mar sclábhaithe. Bhí Pádraig ina measc agus bhí sé croí-briste. In Éirinn dhíol Niall Pádraig do Milchiú. Feirmeoir saibhir a bhí ann agus chuir sé Pádraig ar bharr sléibhe ag tabhairt aire do mhuca. Ar bharr na sléibhe sin, Sliabh Mis, bhí Padraig an-uaigneach, ocrach agus fuar. D'inis sé a phaidreacha gach lá is gach oíche. Smaoinigh sé i gcónaí ar a mhuintir sa bhaile. Chaith sé thart ar sé bhliain ar Sliabh Mis. Patrick was born about the year 385 AD. His father, Calpurnius, was a Christian and Patrick lived a happy life until one fateful day when Patrick was aged about sixteen. About the year 401 AD pirates from Ireland, under the command of Niall of the Nine Hostages, arrived at his village. The pirates plundered the village, stole valuables and took strong young boys to sell into slavery. Patrick was one of those taken. In Ireland he was sold to a rich farmer, Milchiú, and sent to mind pigs on Sliabh Mis. On the mountain top Patrick was cold, hungry and lonely. He prayed night and day and thought of his family back home. Patrick spent about six years on Sliabh Mis. Ansin, i mbrionglóid chonaic sé bád ag fágáil na tire seo ar a bhealach go dtí an Bhreatain. Ghlac sé leis mar comhartha an áit a fhágáil agus d'fhág sé slán ag na muca. Shiúil sé go dtí an fharraige agus chonaic sé an long. Ní raibh aon airgead ag Pádraig agus dhiúltaigh an captaen é a ligint ar bord. Ach d'éirigh le Pádraig obair a fháil ar an mbád agus bhí sé an-sásta leis féin. Bhí áthas mór ar a mhuintir Pádraig a fheiceáil arís. Bhí sé fásta suas ag an am seo agus bhí air smaoineamh ar a shaol agus céard a dhéanfadh sé. Fear an-naofa a bhí ann i gcónaí agus shrochaigh sé ar shaol mar shagart. D'fhág sé slán ag a chlann arís agus d'imigh sé go dtí an Fhrainc chun staidéar a dhéanamh. Rinneadh sagart de. Roinnt blianta ina dhiaidh sin rinneadh easpag de. Bhí muintir na hÉireann i gcónaí ina smaointí agus ina chroí. Bhí sé ag iarraidh dul ar ais chucu le Briathar Dé. Ansin sa bhliain 432 AD chuir an Papa go hÉirinn é. Bhí sé chomh sásta bheith ar ais. Labhair sé leis na ríthe agus na taoisigh agus chreid siad. Bhastaigh sé iad. Thuig Padraig go leanfadh na gnáth daoine a ríthe agus a daoine mór le rá. Bhí an ceart aige agus d'éirigh le Pádraig Briathar Dé a scaipeadh go forleathan tríd an Tír. D'úsáid sé an tseamróg chun An Trionóid Naofa a mhíniú. Go dtí an lá atá inniu ann caitheann daoine seamróg ar an 17ú Márta, an lá a fuair Padraig bás thart ar 461AD. Tá sé curtha i nDún Phádraig, Contae an Dúin. Then, in a dream, Patrick saw a boat leaving this country on its way to Britain. He took it as a sign to leave the place and he bid farewell to the pigs. He walked to the coast and he saw the ship. Patrick had no money and the captain refused to take him on board. Eventually, Patrick got a job on the ship and was he travelled home. Patrick's people were delighted to see him again. Patrick was now an adult and needed to decide what he would do with his life. Being very religious, he decided to devote his life to the priesthood. He left his family again and went to France to study. he was ordained a priest. Some years later he was consecrated a bishop. The Irish people were always in his mind and in his heart. He wanted to return to them and spread the word of God. Finally, in the year 432AD, the Pope sent him to Ireland. Patrick was delighted to be back. He spoke with the kings and chieftains and they believed. He baptised them. Patrick understood that the ordinary people would follow the example of these important people. He proved to be correct and succeeded in spreading the word of God throughout the country. He used the shamrock to explain The Blessed Trinity. To this day people still wear shamrock on March 17th, the day Patrick died around the year 461 AD. He is buried in Downpatrick, County Down.